You’re right! I’ve been promising to end my exile as “a hermit in the Ozarks” and return to the poker arena for a long time. Well, now it’s for real. 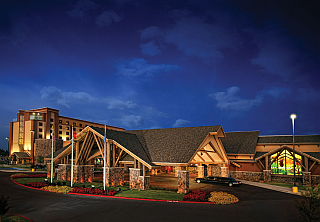 By special arrangement with the Cherokee Casino in West Siloam Springs, Oklahoma, I’m presenting a power poker seminar on Saturday, March 7, 2015 at 2 p.m. This will be my first full-scale appearance since the World Series of Poker in 2009. It will be an intense hour and a half, packed with my latest research and important advice on strategy, hold ’em, psychology, tells, motivation, and more. I’ll even include some compelling life tips for your non-poker guests. I’m planning to turn the poker world upside down with startling, powerful, proven guidelines that will help you destroy the new breed of super-aggressive players who are too clever for their own good. Most of them are losing year after year and don’t even know why. So, it’s time to explain, in easy-to-understand language, how to dominate at poker without losing your bankroll in the process. And that’s exactly what I intend to do. Why Oklahoma? It’s because the Cherokee Casino in West Siloam Springs made my poker heart patter on the first visit. Really! There I rediscovered what friendly poker is all about — without the anguish and the rudeness. And you can play for affordable stakes and not be treated as second class. It’s the way poker rooms should be operated — but, today, most aren’t. And it’s only a two hour drive from my hangout, deep in the forest on a lake. So, what could be a better site to launch a new seminar tour? Here’s the best part: Your $100 ticket is being paid for by the Cherokee Casino. It’s part of my deal with them. The casino has a hotel with extremely reasonable rates. You can even get discounts by signing up for Star Rewards free when you arrive. As most of you know, I don’t use guesswork or homespun wisdom when I teach poker. What you’ll learn are the most profitable avenues to profit, based on millions or analyzed hands and my own computer code — including breakthroughs in poker artificial intelligence. So, you can count on getting major keys to poker success if I can count on you to get here. Previous Previous post: Fast 2015-02-05: Was Seattle play call terrible?